Freddie Prinze Jr. will guest star on Bones next Season as an old buddy of Booth's. That apparently was brought up while Sarah, Freddy and David were hanging out at the pool. But damn Sarah for spoiling the fun. She put a lit on any David/Freddy making out. All joking aside I'm so happy to see they still hang out together. Now if only we could have David and Sarah do something together. That's pretty cool to hear. okay...I really don't know if this would the proper thread to post it, but, I think it's the closest. But i know it's wrong to ship them now that they are both happily married...with adorable and beautiful children. It would have been nice to have Buffy come over, and I know that Sarah wanted to do it and felt bad about not being able to, but I don�t know what happened....I think that decision was made by the Powers-That-Be, for reasons that I don�t know..... I loved working with Sarah and having those two characters together. When they were with each other, Angel was a completely different person. Sarah is�she's�one of the things I will miss the most about shooting the show is working with Sarah. We've created a special bond between the two of us that, um, is unique and different. She has the ability to transform herself very quickly, very professionally, and very openly, which makes it easier for another actor to kind of�ride along with her. She comforts you, and gives you a sense of who you are as a person, and not as an actor. Which is, I feel, the best thing to have. She's just a wonderful presence, and she's very strong in what she does. She exudes a lot of confidence and�and it shows. I'll miss that a lot. She was, I mean working with her is great. The three seasons that we worked together, we never had an argument. I mean that's pretty odd, um -since we were in such close quarters, both of our characters. But, you know she's here in my heart, and that's the best thing about it. And she's actually given me the opportunity to be here where I am today. I mean her character, her show, enabled me to grow and become another character so I owe a lot to her. 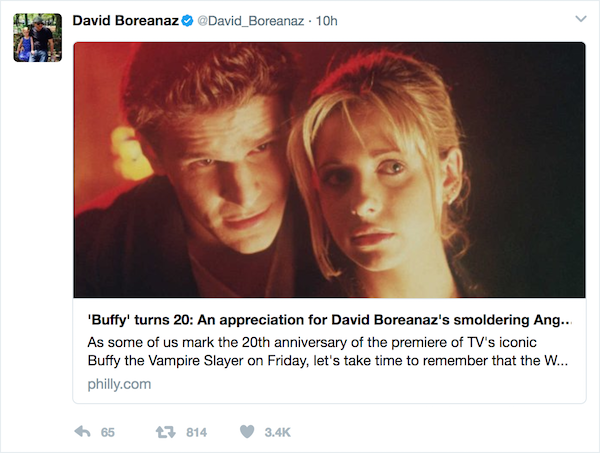 �I liked the simplicity of the Buffy/Angel relationship in the first year,� says Boreanaz. �They shared a camaraderie and it was obvious that they were both at ease around each other and really enjoyed their work. As an actor it was a joy for me to feed that creative process. A number of positive things came out of Buffy's first season and they served to build a solid foundation on which the series could grow." Q: Which was your favourite episode of Angel, I Will Remember You or Sanctuary? Q: did you ever have a crush on Angel (David Boreanaz) I do. Big time. 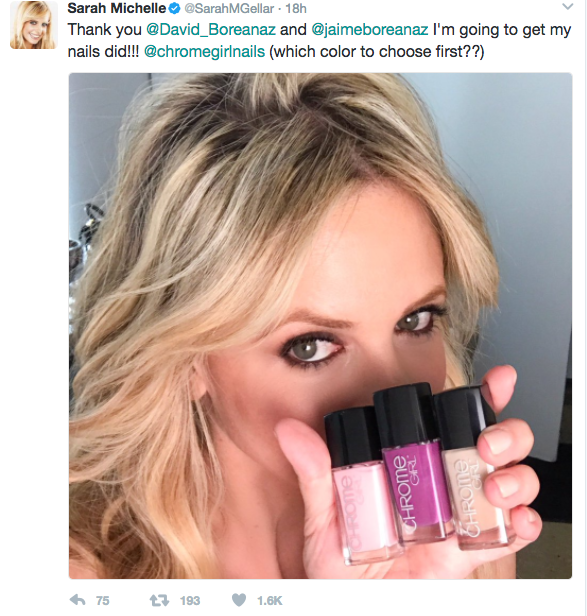 SMG: on Angel or David? Q: Is it a coincidence that you have a dog named Bella and @David_Boreanaz has a dog called Rocky? Mod: Could the actors talk about what they like about their characters? Sarah: I get to kiss Angel. SMG: I get this question alot! It's Angel, of course, always! SMG: I know, but it's Angel, always! Gellar remains close to her fellow actors on the show, in particular David Boreanaz, who played Angel on the show. �David and I still see each other, definitely,� Gellar says. �We were working on the same stage lots for a while and our kids are the same age. We've known each other for a very long time." Plus, Gellar admits, she always vying for Angel and Buffy. �People get so mad at me for this, but I'm an Angel girl," Gellar states. �People can have their opinions of course, but that's mine." SMG: It doesn't hurt! And it�s so funny because we have the same vacation cycle so even if we don�t see each other for the whole year, I know that we will always see each other on holiday. He�s my Angel! �I mean� I �we�ve had�we've been friends for years. Our kids are the same age. And, you know, he is �David! Huffpost: You recently snapped a photo with your Buffy the Vampire Slayer costar, David Boreanaz and his Bones costar Emily Deschanel. What�s the story there? �David Boreanaz (her former Buffy the Vampire Slayer costar), because he's so handsome and yet has a good sense of humor about himself." SMG: With David? Oh my god, he�s been incredibly beautiful, and I think for me, the most amazing part �bout it is he�s a great guy, and he deserves every success he got�and um, has it gone to his head? I don�t think so�at sometimes when he�s around me but I think he�s just kidding me. �It's actually funny, for some reason we always wind up on vacation at the same time and in the same place and it has been happening for years, it's the weirdest! It can be the same hotel, a different hotel, a different state, but we always run into each other." these are just some of the many quotes I collected. How about you guys, do you have any additional or fave DB/SMG quote? David Wishes Sarah a Happy Birthday! David and Sarah know how to portray Buffy and Angel....If only the comics writers were intelligent enough to know how "to write" them....... I agree with others saying that there were fanfictions stories, especially in Scribes, that were written better than the current comics plot making the so-called "canon" story in comics be better considered as fanfics instead. 2) Based on the amount of views and comments, Bangel's fanbase is still strong and it seems most of them are not aware of the comics. Good for them! Why ruin something beautiful as B/A story and be replaced by an "abominable" B/S storyline, anyway? 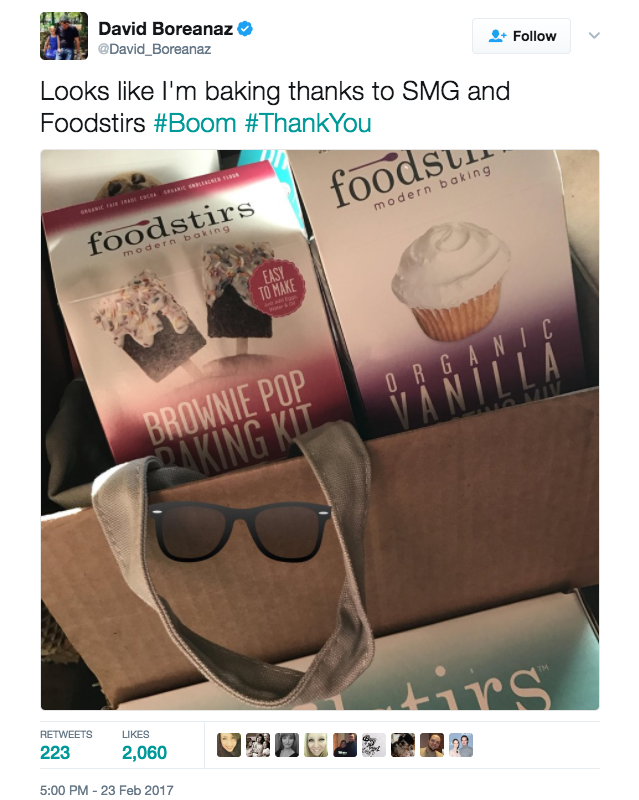 I loooooooooooooove how SMG and DB are still such good friends. I love even more the way SMG still loves "her Angel" and references the Buffy/Angel forever love. She's such a B/A shipper and since I am as well, I will always love this. -And I love how she made an effort to greet him differently in twitter and IG/FB. -And I love how overwhelming the pro-B/A comments of the fans in spite of the picture being a manip. -I was kinda hoping she would post a recent & "real" pic of them, but I guess, I just settled for the greeting. Besides she still calls him "My Angel", and that's all that matters. It's difficult for me to let go of my love for B/A whenever I see DB and SMG showing a powerful connection to the character themselves. 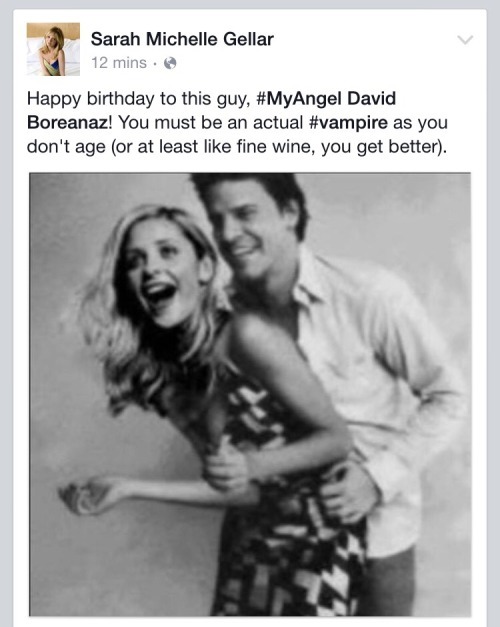 Before, I used to say that being a Buffy/Angel fan made me follow DB/SMG's friendship, but now, DB/SMG's friendship is the main reason why I am still a Buffy/Angel fan. just adding some recent DB/SMG social media interactions. On World Series, Nov. 2016, They used the word "bake" and "eat" and it made my heart flutters as I imagined Angel asking Buffy if "she's already baked". Well, these aren't new but it's an update for this thread. SMG may not be as active as she was on showing Bangel love because B/S fans just succeeded on "silencing" her, but I still can't help to be happy that DB and SMG are able to "re-connect" on social media that Bangel fans can see. Anyone here would like to make a Bangel fanfic out of these materials? huh, anyone pls.? oh sorry. My bad. It is working on my browser and I can see the images. But when I put it incognito, the images aren't visible anymore. Nonetheless, thanks for putting the original links. Though for those interested, the last image is a snippet from SMG's interview on 2014 about keeping the communication alive between her and DB. Sorry for the size of the image, but this is linked to my twitter page and i don't know how to make it smaller. This one is from a few weeks ago, but it involves baking, so I had to share.